In all, Creative Cloud 2017 comes with 16 new desk­top apps (Photo­shop CC 2017, Illus­trator CC 2017, InDesign CC 2017, Animate CC 2017, Premiere Pro CC 2017, Muse CC 2017, and all your favor­ites), together with other comple­mentary tools and services (such as Acrobat Pro, Typekit fonts, Adobe Portfolio, Creative Cloud Market) and much more. 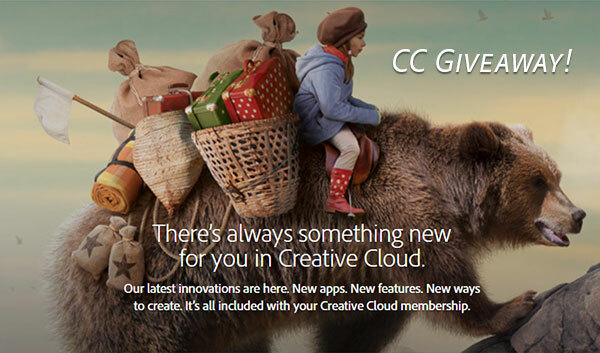 See the entire contents of what’s in Creative Cloud, where all ongoing upgrades are auto­matic­ally included at no addi­tional cost. We’ve given away over $33,000 worth of Adobe software over the years… And for this new giveaway, the prizewinner drawn will receive a fully-paid annual membership to the complete Adobe CC 2017 Release (esti­mated value US$650 / €720 / £607), to help you go from blank page to brilliant. Our thanks go out to Adobe Systems for generously furnishing this prize. Submissions are open until 11:59pm EDT on Thursday, June 29th, 2017. The winner will be drawn at random from all valid entries, and contacted via email – and we’ll announce the lucky recipient (first name only) right here the following week. If you’re the one, we’ll send you a special prepaid Creative Cloud 2017 membership voucher completely free! Would love to finally upgrade. I would love to further my journey into creating for my personal use and maybe spread my wings later when I feel like I am very good in what I am doing. Has this been won? I never seem to get notification or see the results of your contests… PLEASE advise… Thanks! My PC was stolen along with my Adobe Suite and I have no way of replacing it. It would be cool to be able to win it back. Hi Michael, thanks for your interest and participation. To answer your question: yes, last month – see the announcement here. It would be nice to see the full potential of the whole suite without the trial limitation. 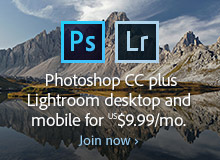 I work with Adobe all the time and I really would like to have all the programs. I could live with that. I want to start drafting my own patterns for dolls and would love the suite to start doing that.